Square Enix has released a cute animated short to promote blockbuster RPG sequel Kingdom Hearts III. The two-minute movie features the painstaking process of stop-motion, as the Toy Box versions of our heroes do battle with the wretched Heartless. 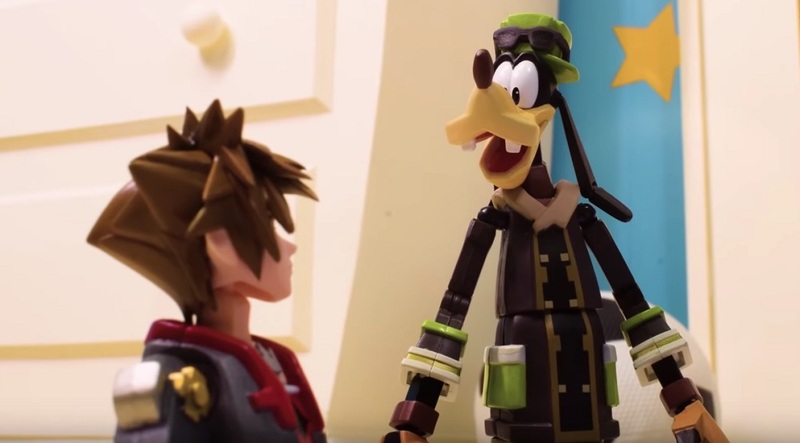 In the video, Sora, Donald and Goofy discover a copy of Kingdom Hearts III itself, but must first battle a small army of enemies before they are able to play it on their non-descript video games console. Finally victorious, the short then becomes a shill for Kingdom Hearts III's excellent review scores, turning all that whimsical Disney magic into CORPORATE GAIN FOR THE MAN. It's a fun little short, I particularly like Donald's thousand-yard-stare during the battle, like he's having a flashback to the horrors of his navy days. Fantastic work by the animators, who must have the utmost amount of patience to work in this nostalgic style. The only thing missing is the game box featuring CJ Andriessen's amazing alternate art.